Lepeda Kefalonia: One of the most impressive and beautiful beaches of Kefalonia is Lepeda, unique for its red and orange waters. The beach stretches for 100 meters south of Lixouri and 33 km west of Argostoli, the capital of Kefalonia. The beach is characterized by its red sand while impressive rocks in bizarre shapes add to this unique landscape. 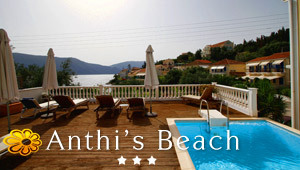 It offers exquisite views to the gulf of Argostoli, the Saint Theodori lighthouse and Mount Aenos. Lepeda provides several facilities like sunbeds and umbrellas, a snack bar while plenty of restaurants are found in Lixouri. Some meters from the beach is a lovely monastery and the cave of Agia Paraskevi. Behind the beautiful cave is a church carved into the rocks. According to the locals the water dripping from the wall of the cave are remedy for eye infections. Lepeda beach is a popular hub both for tourists and local people during the summer period. A nice choice of accommodation are found right behind the beach. The best way to reach Lepeda is via car but there is also a ferry connecting Argostoli with Lixouri. The attractive landscape of Lepeda captivates all visitors.